Hello everyone! We are working on two new projects right now. One is a holiday themed casual game called "Bauble Disaster", the other is a Shooter/ Simulation mix. Both will be released for mobile devices (iOS/Android) and PC/MAC. 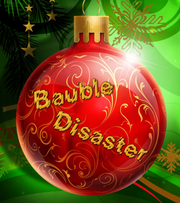 "Bauble Disaster" was a spontaneus idea today and there will be more details about it on the game page very soon. The other project will take a longer time to finish because it is still in the pre-alpha and planning stage. If you are interested in testing our new games and want to help squish some bugs we would be happy to hear from you. Just fill out our application form.